Step forward desker queen for a round of applause and a virtual bouquet of flowers. I'm sorry I haven't got real ones to you. Well it has been seven weeks since I last posted, and I am still battling with tennis elbow/tendonitis. This severely restricts my ability to do much in the way of crafting, and or using the computer keyboard, both of which cause severe pain from above the elbow to my finger tips. 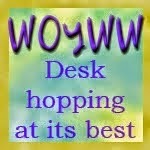 However in those seven weeks, I have visited lots of desks and made a few comments, and even tennis elbow can't stop me posting for the 300th edition of WOYWW and will visit and comment as much as I am able over the next week. So down to the serious business of sharing my desktop, and I'm afraid my desk will be a bit of a disappointment for anyone looking for great creative genius. We have been away for a week, visiting junior daughter for her 40th birthday, gosh I feel old, and then on to see 92year old uncle in Hampshire, where it has become clear we need to be looking for a care home for him. So we only got home at 7pm on Tuesday evening and unpacking was a priority, however I managed to buy a few goodies at the Works whilst I was away and these have been carefully posed on my work surface to get a picture late Tuesday evening. So there is a nice corner punch on the very right hand side, you can't really see it, some lovely shimmery ribbons, some bling, and a packet of 5 x 7 cards. There is also a vertical die I purchased online before I went away and it was in the post when I got home, and there are five unfinished symphonies that I had put on my desk about 10 days ago, in the vain hope that I would get something finished before we went away. Well, time to do a bit of visiting. Morning Chris. Good to find you here this morning. trust J's birthday went well and that you enjoyed time with grandson. Sorry to hear Uncle J is so unwell and needing more care. Presumably another trip down there is in the offing - bless you. In the meantime, I have the tickets for the show!! So don't be away then - John's coming too! Sorry to hear that you're still in pain from the tennis elbow :-( I hope it clears up a lot quicker..... I'm glad you had a good week away - I have a similar issue with my 92 year old dad, who is finding looking after himself very tricky these days. 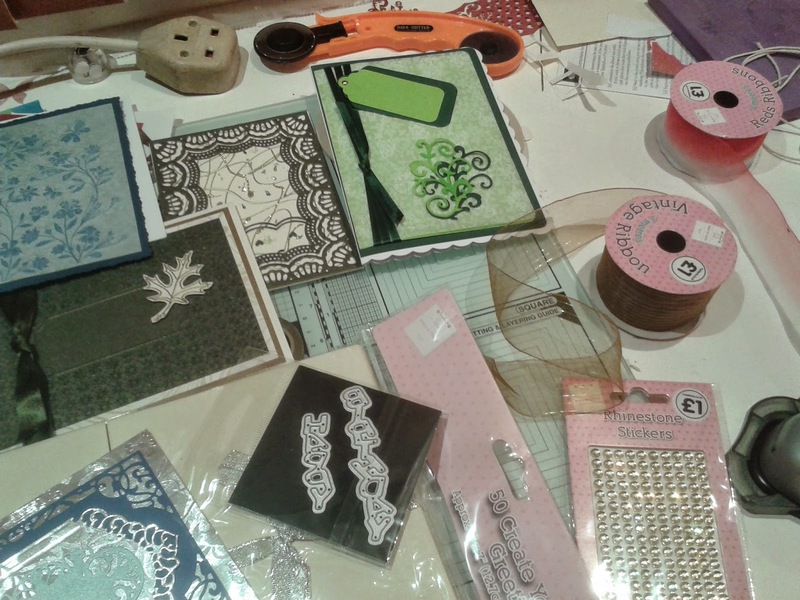 You have a lovely pile of new goodies there - hope you feel well enough to have a go at crafting soon! Really hope that tennis elbow improves for you very soon.....it's so painful :-( Really love thos flowers and you look to have some fab stash on show too. Sorry to hear about your pain. So great to meet you on the other hand. Thanks for sharing the lovely flowers. Come have a visit at my desk, you might have ideas for what I'm working on. How sweet of you to "order" flowers for Julia. That was a nice touch. Sorry about your uncle, though. I fear your tendinitis will not go away any time soon, but rest (and no repetitive motion) will help. Looks like you got some lovely goodies on your trip, though. Happy 300th WOYWW from #3.